St Wilfrid’s CE Primary School, Manchester has recently achieved the national award for Inclusion. The school has recently undergone a transformation since their last Ofsted inspection and it now provides children with inspiring and engaging teaching and learning in a happy school with a strong sense of community. The Head of School, leaders, teachers and support staff in the school, parents and children are proud of their school and all share a commitment that St Wilfrid’s, and all the children there, will achieve the very best that they can. The inclusive ethos, values and skills of St Wilfrid’s CE Primary School are well summed up by comments made by parents, children, governors and staff during the IQM assessment: Distinctive, approachable, stable, flexible, extraordinary, transforming, open, transparent, unique, improving, encouraging, friendly, Christian, joyful, kind, fun, cool. •	A learning walk around the school. •	Examining children’s work in their books. •	Lunch with the pupils. •	Discussion with Head of School, SENCO, senior and middle leaders. •	Discussion with teachers and teaching assistants. •	Discussion with academy trust director. •	Informal discussion with pupils throughout the day and discussion with the school council. 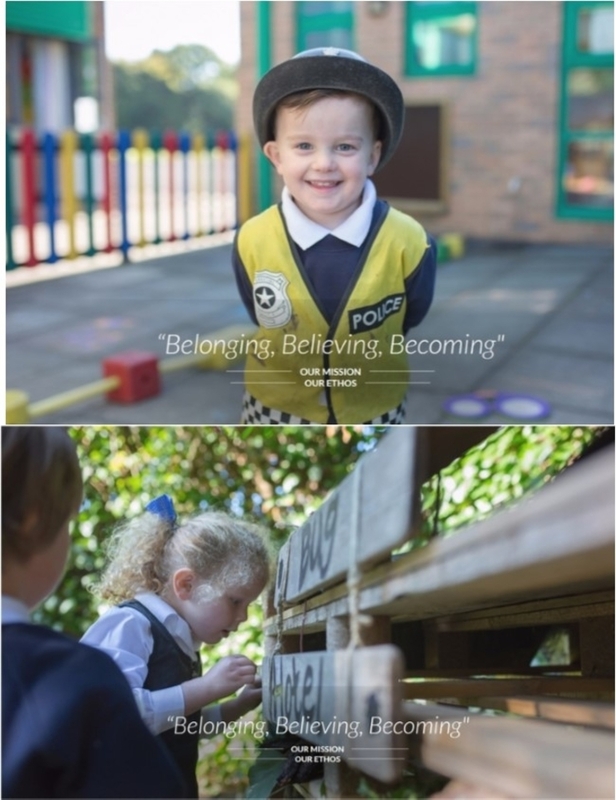 St Wilfrid’s CE Primary School summarises its ethos as ‘Belonging, Believing, Becoming’. In my time at the school I saw that children, staff and parents do feel a strong sense of belonging to the school, church and wider community. Children are eager and confident learners who have a strong belief in their own ability to achieve and in the school staff to support them in this. The school takes very seriously its responsibility to develop children to become the best they can and to become responsible, caring, Christian citizens. Children at St Wilfrid’s are recognised as individuals and the staff are committed to ensuring each child is confident, happy and achieving their full potential. When a child does experience some learning or other difficulties the school quickly provides appropriate expertise and support. All staff at the school are provided with training, support and challenge and there is a strong, shared commitment to the school’s inclusive ethos. The Head of School is supported by senior and middle leaders who are aware of the importance of their roles and committed to maintaining the highest standards. She recognises and celebrates the many strengths of the school but continues to drive developments forward striving for further ongoing improvement. Parents, children, staff and governors speak extremely highly of the leadership, openness and commitment to the school she shows. Support and challenge is provided by the St James and Emmanuel Academy Trust which includes opportunity for peer review and sharing of expertise and developments. The trust is committed to St Wilfrid’s maintaining its own identity with local governors to ensure the school is able to meet the needs of the community effectively. Children at St Wilfrid’s CE Primary School are happy, considerate, articulate and confident. In lessons they are eager learners engaging well and able to talk about their learning. Outside the classroom the caring, respectful ethos of the school is embedded and children show respect and kindness and schemes such as School Council and Year 6 Ambassadors enhance the sense of community in the school. Parents are extremely positive about St Wilfrid’s CE Primary School. They value the approachability and openness of all staff at the school and are confident that, if there are any difficulties, these will be dealt with effectively. The school is proactive in ensuring they are approachable and accessible to parents and in seeking the view of parents.